Jesus was astonished at the centurion’s faith and because of it, healed his servant from a distance without personally laying hands on him. It is a great consolation to all Christians that God’s Holy Spirit is able to heal without Jesus’ physical presence. Let me illustrate with a story. When our daughter Emily was born, she was diagnosed with Down Syndrome and a serious heart condition known as an A-V canal – holes in her heart between her auricles and ventricles. Three different pediatric cardiologists examined her and concluded she needed early surgery to repair these holes in her heart. On the weekend before her scheduled surgery, some close friends came to our house to pray for healing for Emily. A few days later, Emily was admitted to Washington’s Children’s Hospital for a pre-op cardiac catheterization with the surgery to follow. After completing the catheterization, the cardiologist came bounding into the room where my wife was waiting and joyfully exclaimed, “Mrs. Dalgetty, I have GLORIOUS news! There is no hole between her ventricles, and the hole between her auricles can wait to be repaired when she is older and stronger. Right after Emily’s fourth birthday she had surgery to repair the hole between the auricles and she came through the ICU and release from the hospital much faster than expected. Today, she is 31 and works every day at a bakery and catering business. Her joyful spirit has brought many blessings to our family and friends. This entry was posted in Power of the Holy Spirit and tagged Healing from a distance on June 20, 2017 by Bill Dalgetty. Beautiful story, thanks for sharing. We are so blessed,arent we. 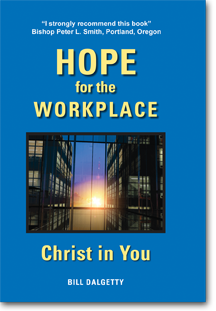 Maria, thank you for reading Christ in Life and Work. We are indeed blessed by our special children.